Or more precisely, my three short stories in These Broken Worlds have been nominated for the Sir Julius Vogel Award. In ‘A Tale of Two Moons,’ an alien longs for her destroyed homeworld. In ‘The Day the Sky Burned,’ I give a ground zero view of the day the Great Alien War broke out, and in ‘When Stars Blink,’ an eyewitness describes the arrival of the aliens (You can still download TBW free here). I suppose the award can best be described as New Zealand’s version of the Hugos. I may be wrong, but I’m excited so it’s quite possible I’m not thinking clearly. The Sir Julius Vogel Awards are fan-voted awards, given by the SFFANZ (Science Fiction and Fantasy Association of New Zealand) for contributions in the science fiction, fantasy or horror fields, and fans can vote for novels, short stories, art, fanzines, or just services to Science Fiction in general. The award is made with the generous support of the Weta Workshop. Yes, the same people who designed things for Lord of the Rings and The Hobbit and many other movies. Voting takes place at the National Science Fiction Convention here in Wellington each year and nominations for this year’s awards are now being accepted. Deadline for nominations is 8.00pm PST on 28th February 2016, which is just around the corner. Oh, and anyone can make a nomination and it is free! So there you have it. My first ever nomination for words I wrote. I know it’s just a nomination and that the number of nominations will decide who lands on the final ballot, but as I write this blog, glee pumps through my veins and it’s a good feeling. You may recall TBW being mentioned on Tor.com’s Aurora Australis last year. I remember writing at the time how awesome it felt. 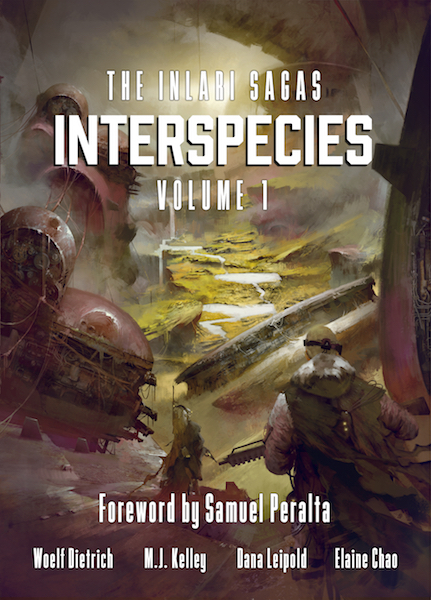 But then, TBW is a mini-kōsalogy of awesomeness and a lot of love and commitment from a very talented group of authors went into producing this precursor to “Interspecies,” and so I’m really thankful for the recognition it’s getting. My smile is tickling my earlobes but I have to get back to my story for “Interspecies.” I can tell you this, though, as an indie author the nomination inspires the heck out of me. With a toothy grin, I bid you farewell.